great pictures as always Carissa! :-D They are darlings...when they are sleeping. lol. Here is there cage, updated. 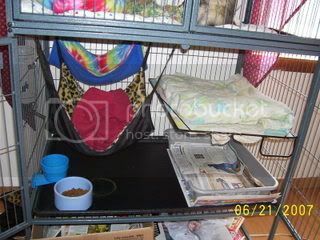 I feel bad that they don't have more bedding, but eh, i don't have the money right now. Seeing the ferret pics on here makes me want one even more. I don't know if I really want one tho.They seem like a TON of work.And I already have a 3 yr old kid,so I dunno if I want a ferret right now. 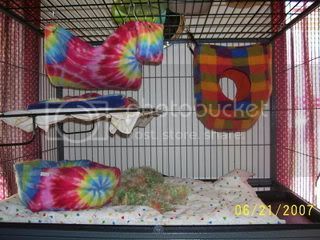 I know a couple of people who had ferrets tho and they were a riot! What silly animals!!! How adorable all these little fuzzbutts are! !